After six years specialising in vehicle tracking and telematics, HandsOn Systems is preparing for the local launch of Radio Frequency Identification (RFID) technology. It has teamed up with two of the world leaders in the field, the US company Alien Technology and the HID Global, a subsidiary of the Swedish Assa Abloy Group. Next month it is holding a conference in which it will outline its major investment in RFID technology and its planned roll-out in a number of identified target sectors. 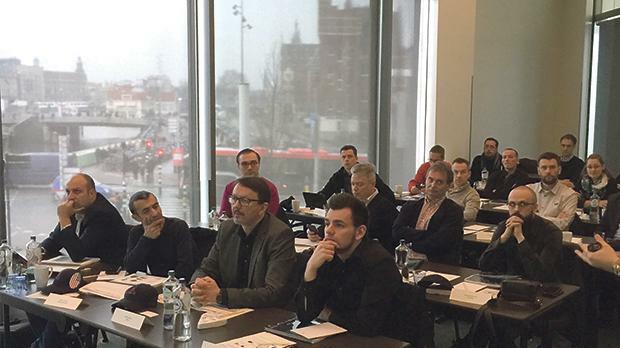 In anticipation of this development, chief commercial officer Simon Bugeja and technical executive Daniel Tutulan last month attended an intensive, hands-on two-day workshop at the world-renowned Alien Academy, held in Amsterdam. The highly practical course was delivered by Steven Shauer, senior field applications engineer and programme manager at the Alien Academy, and Stephen Crocker, director, sales channels, EMEA, Alien Technology. Among the participants were over 25 IT specialists from several top companies, including Bosch Technology, the Mercedes-Benz parts division and Coca-Cola from Germany, Greece and Romania. According to Mr Bugeja, this was a very useful workshop in which participants had the opportunity to try things out, programme various devices and see the antennae, reader and tag designs work in different scenarios. “RFID is not a plug-and-play system,” he said. “There are hundreds of different RFID tags that need to be programmed for their specific tasks and there are advantages and disadvantages of the different tags and the technology they deploy,” he added. RFID technology helps organisations to control or monitor what is going in and going out of their inventory system with less room for human error and at lower cost, minimising the incidence of theft. The tags operate at different EU-regulated frequencies, from LF, HF to UHF, and are categorised into two: dry tags, which are of the clamp-on type and can be re-used, and wet tags, stickers that can be applied once only. Each tag has a unique ID which can either be write protected or user defined. It has applications with legal and accountancy firms for file tracking, laundry companies for clothes tagging and is currently being implemented at Mater Dei Hospital to track asset movements to the last seen area. Its clients internationally include the food giant Nestlé. Among the considerations for its implementation are site analysis, radio frequency physics and its impact on a successful RFID deployment, and the setting out of clear design criteria. There is then a huge choice of RFID peripherals for such equipment as conveyors, stretch wrappers, fork lift trucks, portals, handhelds, printers and applicators.